Ravi is a mason. 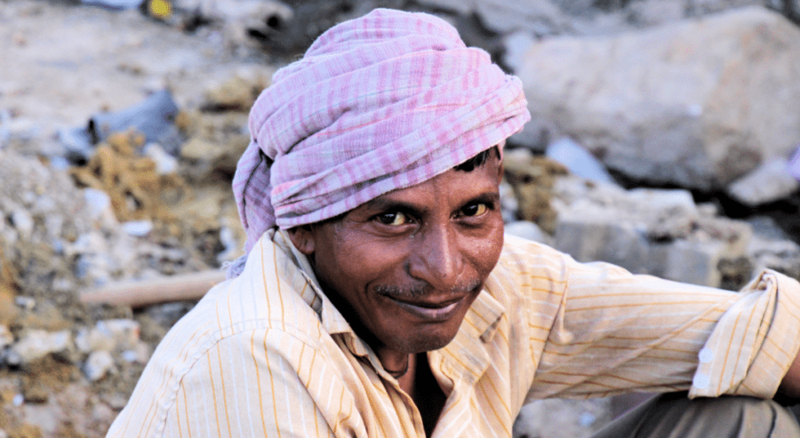 His people are common laborers and general artisans. Many years ago, Ravi unlawfully married two women and began having children with both of them. As a result he was ostracized from his community and his whole family, both wives and all the children, were forced to live in a miserable place on the side of the road, outside of the village. Often you will see makeshift “houses” outside of villages where people will live together for various reasons. In addition to multiple wives, Ravi was also known for his heavy drinking, stealing and bullying people. Prior to becoming a disciple of Jesus, his business practices were corrupt and just about all he did was dishonest. For many years Ravi was seeking God, or anyone who would rescue him. While working in a nearby town, he met Simon who sensed his spiritual hunger. Simon went to his home to share the Gospel with Ravi’s family. Simon did not judge Ravi, which opened him up to learning more about Jesus and they immediately began a Discovery Bible Study in their home. Gradually they invited a few other families to join. Eventually, the whole family turned to the Lord – all fifteen of them: Ravi, his two wives and all of their children. When he turned his life to the Lord, his moral life began to change and people in surrounding villages noticed. This opened the door for Ravi to begin Discovery Bible Studies in five other villages. Two of Ravi’s sons have also each started two Discovery Bible Studies themselves. Ravi’s oldest son is engaged to be married to a girl who comes from the mainstream religious community of that area. What is remarkable is that, although his son is a follower of Jesus and his fiancée’s family are staunch followers of their gods, they have opened their home for Ravi’s son to facilitate a Discovery Bible Study with them. Ravi is now running a legal masonry business. People can see that his life, and that of his family, have been transformed. They have become models in their community. All of this happened in just three months. Ravi’s story is similar to the story of the woman Jesus met at the well – a person who had a certain reputation in the village that caused her to be marginalized. Yet it is such people the Father draws to Jesus and, just like the story of the woman at the well, the Father was at work in Ravi’s life. Now a whole region now has the opportunity to know the truth about Jesus, who sets men free and transforms their lives. * Names have been changed to protect the identity of our church planter and disciple. You can be a part of helping more Ravi’s transform their lives with Christ and impact their family and community. We pray you’ll join us and support Cityteam’s International Disciple Making Movements.